Tens of thousands of people across the UK have been marking the first ever Armed Forces Day by paying tribute to British servicemen and women. The government changed the name from Veterans Day to raise awareness and appreciation for those on active duty. The Queen attended a ceremony in Edinburgh and around 200 other events were held across the country. This year's main national celebration was held at the Historic Dockyard in Chatham, Kent. 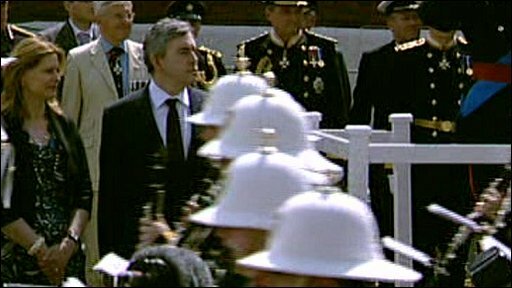 The official party included Prime Minister Gordon Brown and his wife Sarah, the Duke and Duchess of Gloucester, and the Chief of the Defence Staff, Air Chief Marshal Sir Jock Stirrup. Mr Brown said: "The people that have come here today have shown the high esteem and regard in which they hold the Armed Forces of our country. "The Armed Forces who do so much, the families who make such sacrifices. I don't think we say thank you enough, today is our chance to say it and say it with one voice, thank you very much to our Armed Forces." Sir Jock said there would always be a "tiny minority" who reacted negatively to the military. But he went on: "I believe people in this country distinguish between the missions and the Armed Forces themselves. "People have always appreciated their Armed Forces but we have not always in the past given that appreciation the tangible expression it needs. "That's changed over the past few years and I think this is just a reflection of that." Both the Queen and the Prince of Wales also sent messages of "deep and enduring gratitude" to Britain's past and present soldiers, sailors and airmen and women. The Queen presented campaign medals to the Royal Scots Dragoon Guards as the regiment's Colonel-in-Chief. In addition to the national event, concerts and parades were held in towns and cities, including Cardiff, Leeds, Glasgow, Manchester and Plymouth. 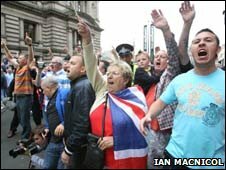 A service in Glasgow's George Square was marred by a disturbance on a nearby street. Protestors, believed to have been from an Irish Republican group, are understood to have started chanting while a service was taking place. Strathclyde Police said the incident involved dozens of people and a number of arrests were made, while one person was injured. Scottish Secretary Jim Murphy described the incident as a "sickening spectacle that showed we still have a long way to go in removing the scourge of sectarianism in our country." During the week, more than 3,000 Armed Forces Day flags were flown by councils, businesses, schools and homes across the UK. Speaking during his first visit to Afghanistan since taking over as defence secretary, Bob Ainsworth said the new day honouring service personnel would be a "huge fillip" to troops. 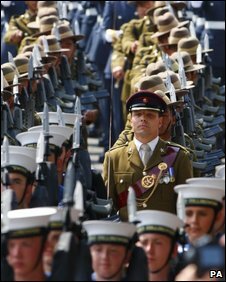 The lack of recognition extended to the armed forces in recent years was "not acceptable", he said. This is an excellent idea, but where was the publicity? He referred to young soldiers he once spoke to, who had recently returned from theatre shortly after he became a defence minister in 2007. "They were telling me at that time that they didn't tend to talk about what they had been up to because people weren't interested," he said. "I just thought that that was so depressing. Now you can see lots of organisations - small businesses, large businesses, communities - trying to show their appreciation. "And it is just phenomenally important. It's a huge improvement on the situation that was existing a couple of years ago."